Earlier this month, Apple began selling an updated World Travel Adapter Kit, which offers a set of seven AC plugs and prongs to fit in different electrical outlets around the world. The new kit that Apple's selling no longer includes a 30-pin to USB cable, and rather than adding a Lightning to USB cable, Apple has instead opted to ship the kit with no cable and drop the price by $10. 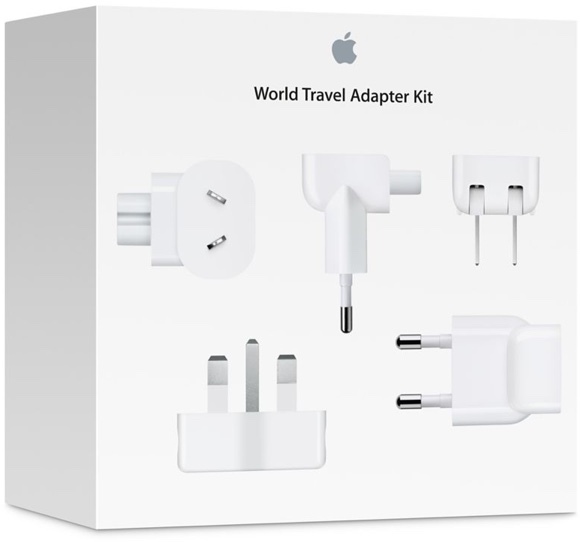 Apple's updated World Travel Adapter Kit includes seven pieces (up from six plus a 30-pin cable) and specifies that it supports outlets in Brazil in addition to North America, Japan, China, United Kingdom, Continental Europe, Korea, Australia, and Hong Kong. Apple has also updated the language specifying which devices the kit is compatible with to reflect its newest products. The updated World Travel Adapter Kit can be purchased from the online Apple Store for the new lower price of $29. It's also available in many Apple retail locations. The UK plug is big and it can be annoying, but it's also the safest plug design in the world. After spending a lifetime using them to me they feel much more solid and safer than a Euro, Australasian or American plug. It's the safest plug in the world. Don't hate. I always get annoyed by the UK one. could they be any bigger, like for real. Do you travel to the UK? Do you use the UK adapter regularly? If not it seems like a rather petty thing to get annoyed about. I am in the US and have never traveled to the UK or used a UK adapter so I see no reason to be annoyed by it. Might just be me, I don't know. It's the safest in the world. It's fused so if something does go wrong you will be safe at your end - unlike other fuses where there is one fuse so if one thing goes wrong everything goes wrong. It's more likely to cut power also to protect you from the electricity. You cannot poke anything into the plugs without putting something in earth firdt making it safe for babies in the house ( the baby plugs, although you can buy them, cannot be certificated and can pose a risk). They are also insulated so when you pull the plug out or push the plug in, if you got your hands touching the pins, you cannot push it in far enough to turn on the power as where power does start is insulated. Only pain in the backside is when you drop them they always point in up and when you wake up in the middle of the night and step on one - lets say you will probobly wake next door also! Absolutely, we have them in Ireland too. Easily the strongest feeling, sturdiest at staying in place and safe plug I've ever used. The Italian is wobbly for having 3 pins, but all in a line. The European only has 2 pins and often falls out too. I travel to the Netherlands a lot and it annoys me every time. And the Austrailian and US ones are like something created at shop class 101, by a kindergartener, who got a D-. GREAT - the box no longer includes a cable, a cable that costs $21, and they lower the price by $10 - GREAT.